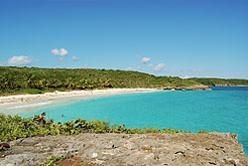 The island of Vieques lies 8 miles off the east coat of Puerto Rico and together with Culebra known as part of the 'Spanish Virgin Islands'. Vieques is just 21 miles long by 4 miles wide, for decades the majority of the land area was restricted to use by the U.S. Navy as a testing and practice range. The U.S. Navy left Vieques in May of 2003, leaving behind an island unspoiled by development, now Vieques is promoted for its ecotourism opportunities. Most of the old Navy areas are now under the control of the U.S. National Fish and Wildlife Service (787) 741-2138; www.fws.gov in cooperation with local and national Puerto Rico government. Marked by inspiring sunrises and sunsets, deserted beaches, excellent snorkeling and the ecotourism banner, Vieques has attracted many small inns, restaurants and the new environmentally conscious W Retreat and Spa, Vieques. 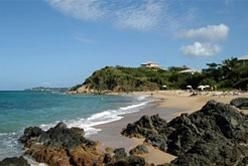 Vieques is a laid back island so much of the activity revolves around sun and sea activities. Snorkeling is great at Blue Beach; other very nice nearly deserted beaches include Orchid Beach, Sun Bay Beach, Punta Arenas as well as Esperanza Beach. Not indicated on the map below is Black Sand Beach a spit of jet black powdered sand that glistens in the sun. To reach Black Sand Beach, head out of Esperanza on Route 996 until you reach Route 201. Continue west for about 50 yards to the Jaguey sign just before Casa Vieja Art Gallery. On your left will be a trail, follow down to the beach. The rocks can be slippery so be very careful! The Beaches are regularly listed as one of the best in the Caribbean for their crystal clear azure waters. Vieques is the location for Mosquito Bay a pristine bioluminescent bay. The 'Bio Bay' gets its luminescence from microorganisms called dinoflagellates that glow neon blue when the water is disturbed. Vieques has two towns; Isabel Segunda in the north is the islands administrative center and close to the Antonio Rivera Rodriguez Airport and Ferry Docks. The town is the oldest settlement on Vieques founded in 1843 with historical sites such as the 1896 lighthouse and the last Spanish Fort to be built in the Western Hemisphere. Esperanza in the south is truly a Caribbean experience, laid back, musical and friendly this town on a narrow strip of beach is miles away from chaotic San Juan. Drive an hour east from San Juan and take a passenger ferry from Fajardo . Once at the ticket counter, the longer line is usually to visit Culebra, not Vieques. Still, locals flock into either of the outlying islands on weekends, so it is best for you to visit on a weekday in order to avoid the crowds. Either way, if you can buy tickets in advance, do so. Free passage for seniors over 75. You can fly from mainland Puerto Rico to Vieques from various locations. Flights are scenic and last between 8 - 20 minutes, providing great value for money. From San Juan International Airport (SJU) is a 30-minute flight, costing $115 via Vieques Airlink and $109-119 via Cape Air (each way)** If flying directly into Vieques from the U.S., know that United/Continental Airlines offers code share service with Cape Air on flights from Newark and Houston. Checkout our Airlines page for more carriers servicing SJU. **All times, fares are approximate and subject to change. Also endorsed by the Puerto Rico Tourism Company: Inn on the Blue Horizon, Casa de Amistad, Crow's Nest Inn, Caribbean Great Escape, Hacienda Tamarindo, Hix Island House, Malecon House, SeaGate Hotel, W Retreat & Spa. Breakfast: The Window Cafe (attached to Lazy Jacks) and Belly Buttons in Esperanza; El Patio and La Panaderia Viequense (best budget option) in Isabel II. Lunch: Sol Food (by entrance of the wildlife refuge); Shaunna’s (by entrance of Isabel II); El Patio and La Panaderia Viequense (Isabel II, best value); Mamasonga’s and Don Pepe’s (by the ferry dock); Alicia’s cafeteria (downtown). Dinner: Conuco (by the Plaza); Ocean View Bar & Grill (by the ferry dock); Next Course (between Esperanza and Isabel II); Mucho Gusto, Orquideas, El Quenepo, Bili (Esperanza). Best way to see the island is by renting a car or a scooter. You should rent a vehicle in Vieques though, as most companies do not allow you to rent a car in the mainland and take it to La Isla Nena by cargo ferry. Also, due to high demand, advance booking is imperative, even in the low season. Rates for a 4x4 hover around $59-$80 a day; scooters go for about $50 a day across the board. Many companies rent both 4x4’s and scooters, but not always. Contact them for details. For tours in Vieques, there are two operators recommended by the Puerto Rico Tourism Company. While the most sought-after tour is to the Bioluminescent Bay, they both offer a variety of activities. Note: All tours sell out quickly, so this should be one of the first travel arrangements you make prior to your Vieques trip. Island Adventures (787-741-0720): Tour options include Biobay by boat or by kayak. 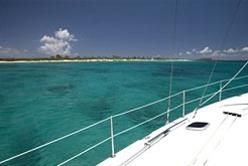 They also offer tours off Fajardo’s marina, meaning that a day trip to Mosquito Bay in VIeques is possible even if you are staying overnight in mainland Puerto Rico. Vieques Adventure Company (787-692-9162): Unique tour offering guests the opportunity to experience the Biobay from special clear canoes. Also, they offer bike trips and other day tours.